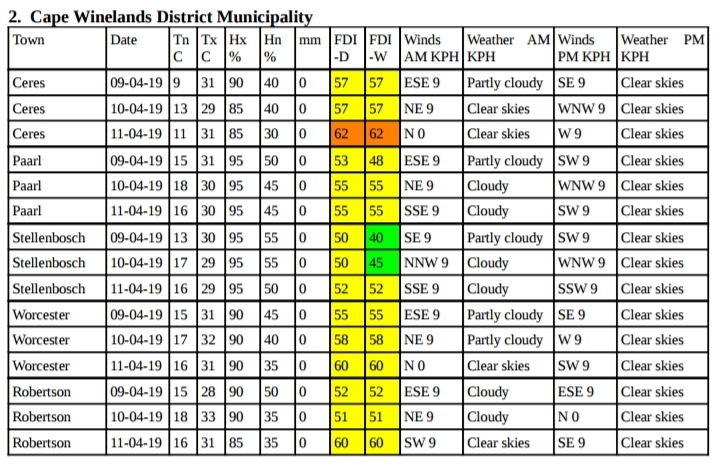 Below the South African Weather Services FDI forecast. This is the only legally accepted FDI in South Africa. 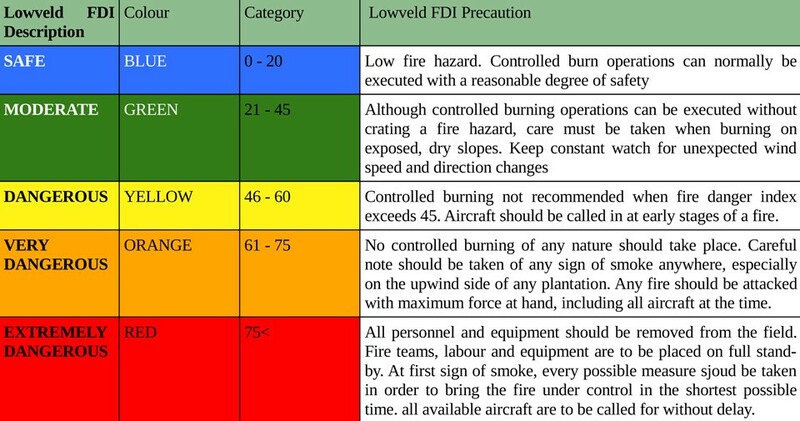 Should be calculated from local readings when conducting a controlled burn. Best calculated at 10h00 and 14h00 using the Lowveld FDI system. You need: the Temperature, Wind Speed (kph), Humidity (%), rainfall (mm) in the last 24hrs and days since last rain. A FDI calculator can be found in the AFIS mobile application. Manual charts for FDI calculation are available from the FPA. Disclaimer: Neither WFPA nor its partners can be held liable for any direct, indirect, incidental, consequential, special or exemplary damages arising out of or in connection with the use of the FDI information provided. The WFPA does not and cannot guarantee the accuracy of the information provided. It remains the responsibility of the landowner to take weather status into account, on the specific day, when doing a controlled burn or fighting a fire. If you have any difficulties in obtaining the FDI please contact us.